I'd originally written this version of Sif for my Marvel Universe Reboot projectm but when a superhero game started set in a Marvel/DC crossover game where the most recent version of Ragnarok had happened, followed closely by the Asgardian Nine Worlds - with the notable exception of Midgard, or Earth - rebooting themselves, I decided to take a few liberties and do up this version of Sif, bringing her both closer to mythology and adding a few other traits. The game Sif was in was a continuation of sorts of the game Silver Arrow was in. Unfortunately, the game died when I went net.dead (that keeps happening!) and the GM indicated that several other players had dropped or were just unable to make a regular commitment. I had fun playing this version of Sif, but I'm not sure that I'd be willing to bring her back to any other game without a reworking. Occupation: Shieldmaiden, former fertility goddess. Identity: The general populace of Earth do not believe Sif to be anything more than a mythological figure. Legal Status: Princess of Asgard. Other Aliases: Sif Goldenhair (a common epitaph), Violet Nordstrom (her alias on Earth). Known Relatives: Thor (husband, separated), Uller (son by Odin), Thrud (daughter by Thor), Magni, Modi (step-sons), Odin (father-in-law), Balder, Hoder, Heimdall, Vidar (brothers-in-law), Loki (foster brother-in-law), Freya (foster sister-in-law). Group Affiliation: Gods of Asgard. Base of Operations: New York City, also Asgard and Vanaheim. History: Sif grew to adulthood as one of the Vanir of Vanaheim, one of the Nine Worlds of Norse mythology. The Vanir are a sister race to the Aesir; together, the two represent the race of Asgardian gods (see Asgardians). Sif was widely held to be one of the most beautiful of the Vanir, second only to Freya. Unlike other Vanir women, however, Sif also learned the arts of warfare, although she preferred not to use those skills when less violent methods could suffice. Her beauty was apparent when she was just reaching adulthood; so much so that Odin, the ruler of the Aesir who was visiting Vanaheim, seduced her. This union resulted in the birth of Sif's son, Uller (see Odin, Asgardians: Uller). At one point, one of the pranks pulled by Loki, the god of mischief, went too far, and Sif's pride - her mane of golden blond hair - was shaved off and destroyed (see Loki). Due to Thor's not-so-subtle manhandling of Loki in retaliation, Loki bargained with the dwarves of Nidavallir to produce a mane of golden hair, which took root and grew the moment it touched her scalp. After the worship of the Norse gods came to an end, Sif continued to help raise Thor's children - two of whom, Magni and Modi, were Thor's sons by a different goddess, although some say their mother was a giant (see Asgardians: Magni, Modi). Thor, on the other hand, grew more sullen and violent as time went on. It was only after Thor hit her in anger that she left him, taking their daughter Thrud and his sons with her; Sif made sure that Thor saw she was taking her sword with her (see Asgardians: Thrud). Sif returned to Vanaheim, but not without regrets. While there she set aside her role as a fertility goddess, embracing her skill as a warrior. Sif has recently appeared on Earth, living in an apartment off Central Park West in Manhattan with her daughter and stepsons and going by the alias "Violet Nordstrom". She has been keeping close watch on Thor's activities, now that he is trapped in the body of a mortal, and has even come to his aid on a number of occasions. Recent discussions with Loki have led her to the conclusion that to release the god she loves, the mortal aspect he is trapped in must die. To this end, she has manipulated various foes of Thor's into combat with his mortal identity; Sif is not aware that Loki is manipulating her into killing her husband, as Thor's mortal and immortal sides cannot presently exist without each other. Uniform: When entering or expecting combat, Sif wears a suit of mail with a custom-fitted breastplate. These appear to be made of Asgardian steel, which is three times as heavy and durable as normal steel. She often wears a green cloak attached to the breastplate's collar. Strength Level: Sif possesses superhuman strength greater than that of a standard Asgardian goddess. She is able to lift (press) 60 tons (the average Asgardian goddess can only lift (press) 25 tons). Known Superhuman Powers: Sif possesses the standard superhuman traits of an Asgardian goddess (see Asgardians). She is extremely long-lived (although not truly immortal like the Olympian gods). Her flesh and bone, like everything from the Asgardian dimension, are three times as dense as a human's, granting her enhanced durability. In addition, she is immune to all terrestrial diseases. Sif also possesses the power of flight. This power was granted to her recently by Odin enchanting her golden hair, which had been made by the dwarves of Nidavallir. In addition, she can survive unaided in outer space. 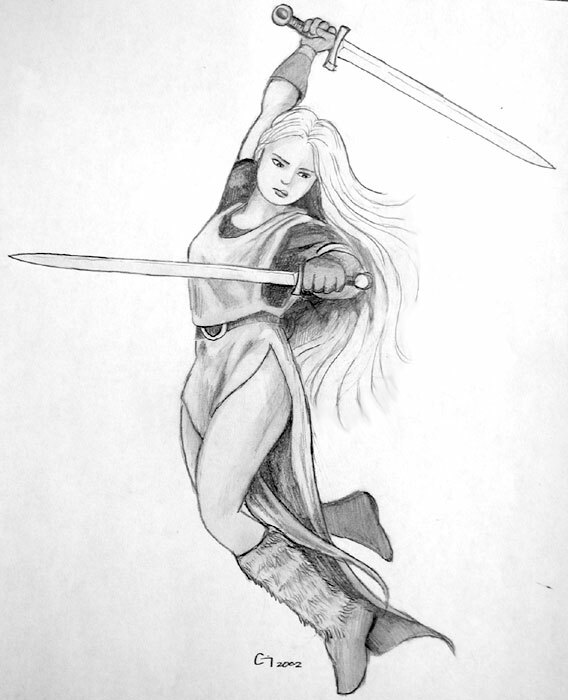 Other Abilities: Sif is an accomplished swordswoman and unarmed combatant. Weapons: Sif wields an enchanted broadsword named Gatecleaver which is made of uru and is capable of slicing through almost any material known to man or god, with the possible exception of adamantium. This sword weighs nine pounds (normal broadswords weigh around three pounds), has been enchanted to permit its wielder to pass between Asgard and Midgard (Earth) with ease. She also wields a round medium shield made of the same material; the shield has not to date shown any magical traits.